Deputy U.S. 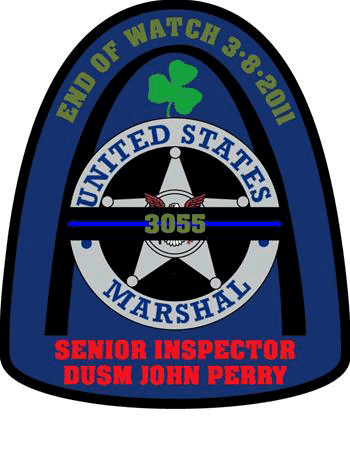 Marshal John Brookman Perry, 48, died in the line-of-duty Tuesday, March 8, 2011, from gunshot wounds received while serving an arrest warrant on a residence in St. Louis, Mo. Deputy Perry was born in Glen Ellyn, Ill., a suburb of Chicago. As the son of a bankruptcy court judge and grandson of a district court judge in Chicago, Deputy Perry literally grew up in the federal courts and as a young child often associated with the Deputy U.S. Marshals assigned to protecting the judiciary. His grandfather, who started as a coal miner and worked his way up to the federal bench, was a great influence on Deputy Perry. A 1980 graduate of Glenbard West High School in Glen Ellyn, Deputy Perry earned a bachelor’s degree in geology in 1984 from Southern Illinois University – Edwardsville. Deputy Perry’s first employment in law enforcement came in the Madison County Probation Office in Edwardsville, Ill., where he worked 16 years in various positions within the office, including pre-trial supervision and high-risk supervision. His brother, Bart Perry, has been a supervisory probation officer with the state of Illinois in Jolliet for 25 years. Deputy Perry had been assigned to the U.S. Marshals Eastern District of Missouri in St. Louis since July, 2005, where he served as a team leader on the fugitive task force and was the district’s firearms instructor. He had been with the U.S. Marshals Service since graduating from the U.S. Marshals Academy in 2001. Immediately following graduation, Deputy Perry served in the District of Columbia Superior Court where, in addition to his duties in the court, he was a volunteer to the call center for the television series America’s Most Wanted. Deputy Perry was posthumously promoted to Protective Intelligence Investigator by the U.S. Marshals Service.